Do I have to have a general anesthesia for my surgery of a trigger finger or trigger thumb? What is meant by a local anesthetic? What is the disadvantage of nerve blockade at the hand or forearm (wrist block)? 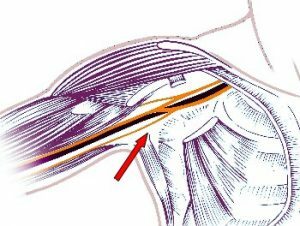 What are the contraindications for a brachial plexus block? In gerneral anesthetic you are put to sleep. Surgery of a trigger finger (or thumb) in an adult patients are nearly almost performed using local or regional anesthesia. Only in a young child, that need to have surgery of a congenital trigger thumb is general anesthesia the first choice. If you need to have handsurgery you should discuss the type of anesthesia that is most suitable for you. Local anesthesia is an injection of numbing medicine into or nearby the tendon sheath (pulley) of the affected finger or thumb. The injection through the skin can be uncomfortable and in some case painful. For diminishing pain an experienced (hand) surgeon is using for local anesthesia a very small needle and injected the numbing medicine very slowly. This method is also called nerve block, wrist block or arm block. In this technique also local anesthetics are used. Unlike the local anesthetic the injecting is not in the area where surgery takes place. The numbing medicine is injected through a needle along the path of one or more nerves. This is of great advantage for the surgeon also in a relatively small operation like the release of a trigger finger. The area where the surgery takes place is not swollen and there is no haematoma formation. An excellent view for the surgeon diminished the risk of digital nerve injury. It depends on which finger is affected by snapping. One possibility is to inject the numbing medicine along the path of the nerves right and left the flexor tendon. The blue arrow in the figure shows this technique when the middle finger is affected. Many surgeons injected the numbing medicine along the path of the median or ulnar nerv at the wrist. (black arrows in the figure left). This technique is particularly useful if more the one finger had to be operated. Hand operations are usually performed in a bloodless surgical field. This reduces significantly the risk of injuring a nerve or blood vessel. 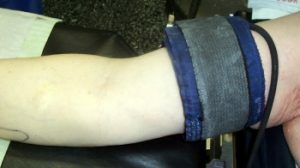 To prevent bleeding during surgery, a tourniquet cuff blocks blood flow in the arm. The tourniquet cuff feels like measuring blood pressure. During a short time the tourniquet cuff is well tolerated. After 10-15 minutes the pain is very uncomfortable and can not be tolerated for more than 20 to 30 minutes without anesthesia of the whole arm. Some surgeons prefer a brachial plexus block, if more than one finger ist affected or if problems during operation are expected. 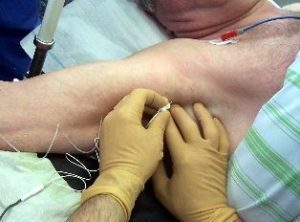 There are many techniques for achieving a brachial plexus block.The techniques are classified by the level at which the needle is inserted for injection of the local anaesthetic . The axillary block is widley used: It is suitable for surgery to the forearm, wrist and hand. In this technique a needle is placed in the axilla. (Compare pictures left) The entry point of the needle is superior of the axillary artery. Is the tip of the needle is near the nervs in the axilla, local anethesa is injected. If a tourniquet during surgery is used, subcutaneous infiltration of local anaesthetic on the inner side of the upper arm will improve the comfort of the patient. 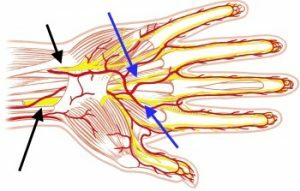 The main complication from the brachial plexus block is haematoma formation as a result of arterial puncture.